It was a pretty wild couple of days for combat sports fans, both with boxing and with the huge Khabib vs Conor UFC showdown. So let’s get to your rundown of the most significant results and impressive performances as we journey from Thailand, Japan, and Las Vegas to Chicago and Quebec City. 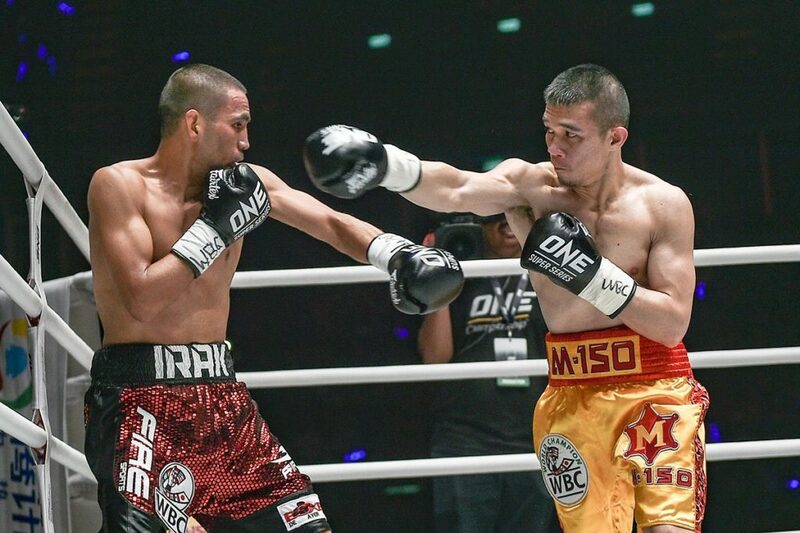 Srisaket Sor Rungvisai vs Iran Diaz: In Pak Kret, Thailand, WBC Super Flyweight champion Sor Rungvisai (aka Wisaksil Wangek) defended his title with a lop-sided points win over tough-as-nails Mexican challenger Iran Diaz (14-3-3). It was consecutive victory number 20 for the southpaw champion as his ledger moves to 47-4-1 with 41 KO’s. Diaz was no match for Rungvisai but he was game and incredibly tough; how he could absorb so many flush shots and survive to hear the final bell will forever remain a mystery. He was staggered more than once by both left crosses and right hooks, but the Mexican just refused to fold and kept fighting back. For some reason Rungvisai had trouble with his footing throughout the match and it could be argued that Diaz should have been credited with at least one knockdown, but it hardly mattered as the champion was never seriously hurt and won almost every round. Fans are now hoping Rungvisai’s next outing is a rematch with Juan Francisco Estrada as their clash last February was one of the best fights of the year. 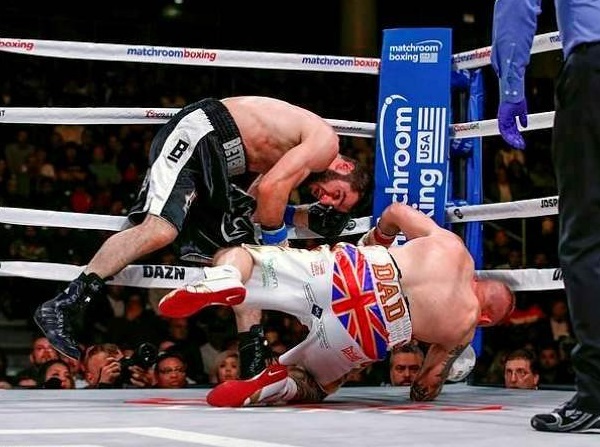 Artur Beterbiev vs Callum Johnson: Nearly a year after his title winning effort against Enrico Koelling, Artur Beterbiev (13-0, 13 KOs) made his return to the ring with a surprisingly nail-biting knockout over the UK’s Callum Johnson (17-1). While typically a slow starter, the IBF light-heavyweight champ reminded fans of his ferocious power right from the very start, flooring Johnson with a hard right hand to punctuate the first round. And though it looked like Beterbiev was headed towards an early victory, the gallant Brit landed a counter left hook in the second that sent the champion to the canvas for the first time in his professional career. Beterbiev’s lethal shots send Johnson through the ropes. But the Russian native rose and regained his momentum in rounds three and four, boxing well and outscoring Johnson before drawing him into a vicious right hand that floored the challenger. Johnson barely got to his feet before the count of 10, but was in no shape to continue and the referee called a halt to the action. 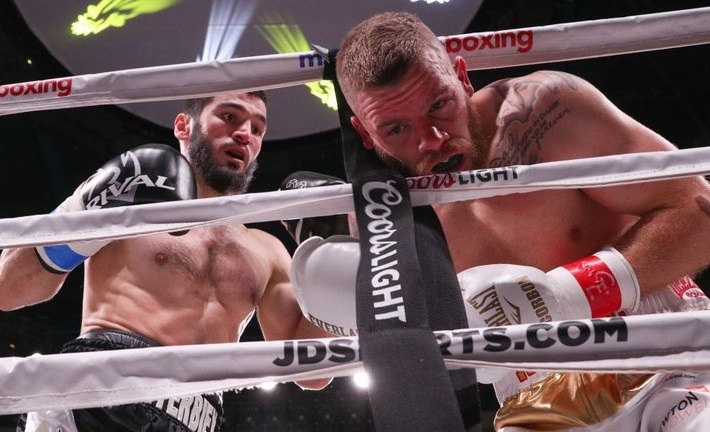 Beterbiev is coming off a tiresome losing effort to void his contract with Groupe Yvon Michel, which cost the 33-year-old a full year of activity and put him on the undercard of an event he had every reason to headline. It is shameful to conceive that an unbeaten champion with the amateur background of Beterbiev was not even co-featured in DAZN’s second broadcast, preceding two non-title fights featuring Jarrell “Big Baby” Miller and Jessie Vargas. Here’s hoping his next match is a showdown truly worthy of a main event. Beterbiev follows through on the final, finishing punch. 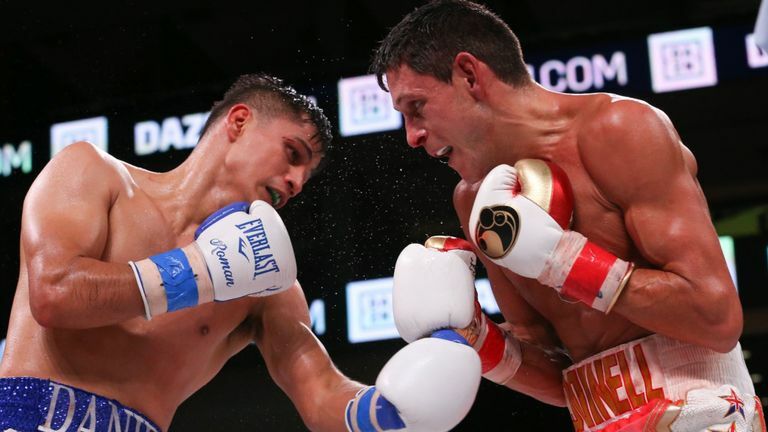 Daniel Roman vs Gavin McDonnell: In WBA 122-lb champion Danny Roman’s third title defense, the “Baby Faced Assassin” retained his belt with an impressive 10th round knockout over Gavin McDonnell. Roman and McDonnell battled on close terms for much of the fight, with the champion working to get inside the reach of the rangy 5’9” British challenger. But Roman eventually broke down the game McDonnell, hurting him with a counter right hand in the 10th and finishing him moments later. Isaac Dogboe is clearly the man to beat at super-bantamweight, but make no mistake: Daniel Roman is a dangerous force at super bantam. Roman and McDonnell mix it up. 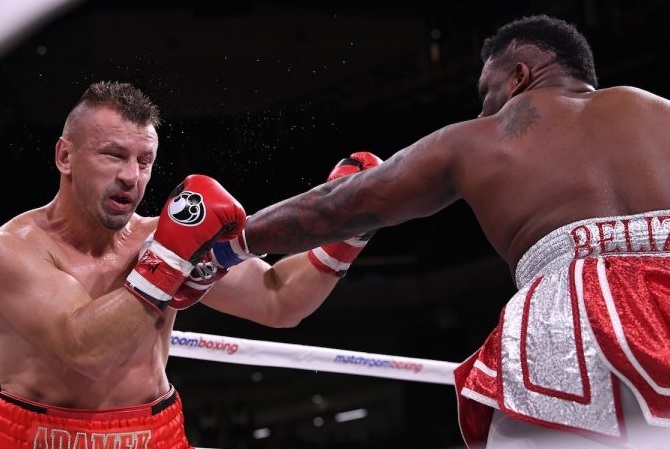 Jarrell Miller vs Tomasz Adamek: Jarrell Miller is on the fast-track to a heavyweight title shot, or so he says. 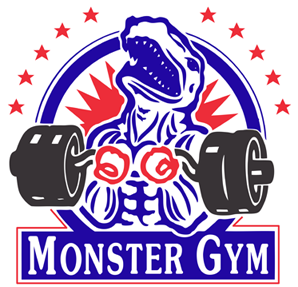 The brash talking 300 pounder known as “Big Baby” surprisingly brings more than just size into the ring, as he has demonstrated surprising agility and endurance in recent appearances against Johann Duhaupas and Mariusz Wach. But last night, Miller didn’t need to bring anything more than his 90 pound weight advantage to the table as he blasted former light-heavyweight champion Tomasz Adamek inside of two rounds. Despite the Pole’s best efforts to use combinations and lateral movement, Miller calmly walked his man down, finally catching up to him early in the second as he floored Adamek with a pair of right uppercuts that put him out for the count. The logical next step for “Big Baby”, in my opinion, is a clash with Dillian Whyte, who like Miller also feels entitled to a title shot against either Deontay Wilder or Anthony Joshua. Both are ranked near the top of the WBA and WBO heavyweight rankings, and the victor of a Miller vs Whyte shodown would be a legit challenge for any title-holder in the big man division. 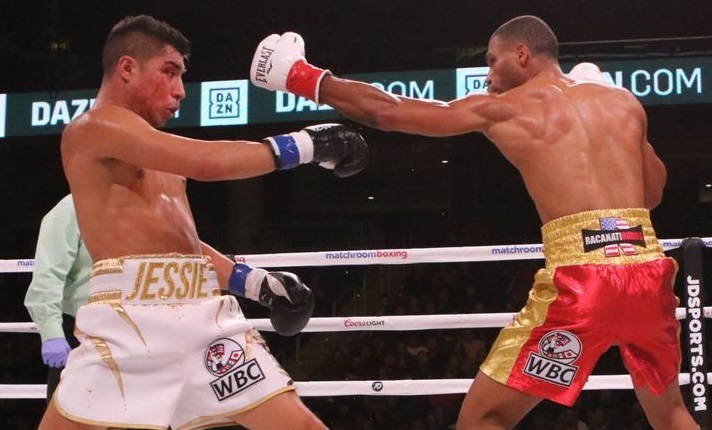 Jessie Vargas vs Thomas Dulorme: In the main event of the night, Jessie Vargas made his first ring appearance since his April draw with Adrien Broner, taking on former prospect turned journeyman, Thomas Dulorme. Dulorme was coming in after more than a year of inactivity following a loss to Yordenis Ugas and was given little chance to defeat former two division world champion Vargas; that is, until Dulorme nearly floored his opponent with a counter left hook late in the first. For most of the rounds that followed, the two were very evenly matched as they engaged in numerous spirited and evenly-matched exchanges. In the 10th round, a right hand by Vargas dropped Dulorme to his knees, which appeared to be the difference maker in such a closely contested match-up. But Dulorme recovered well, fought back gamely, and even scored his own knockdown with seconds left before the final bell. When Michael Buffer read off the judges’ verdict, the 12th round knockdown proved to be pivotal, as it cost Vargas a narrow victory and instead led him to once again walk away with a draw. Here’s hoping we see Vargas vs Dulorme II. 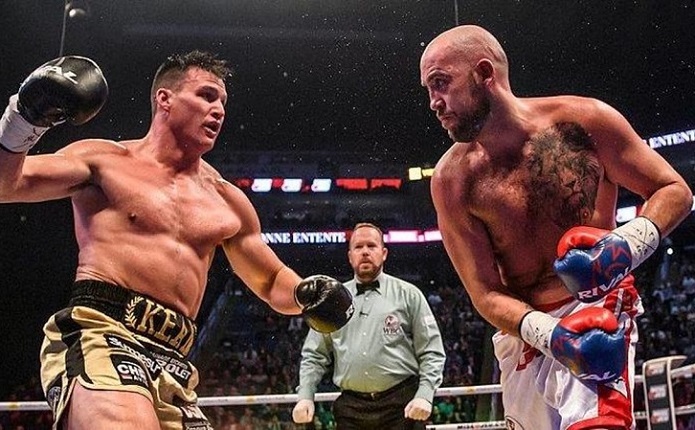 Simon Kean vs Dillon Carman: The Videotron Center in Quebec City hosted a stacked card from Eye Of The Tiger Management with no fewer than ten scheduled matches and the main event continued a trend in Canadian boxing, namely when two big men face-off, it has to be a war. Carman cracks Kean with a left hook. Kean, undefeated in 15 bouts, was coming off a brawl with Vancouver heavyweight Adam Braidwood. 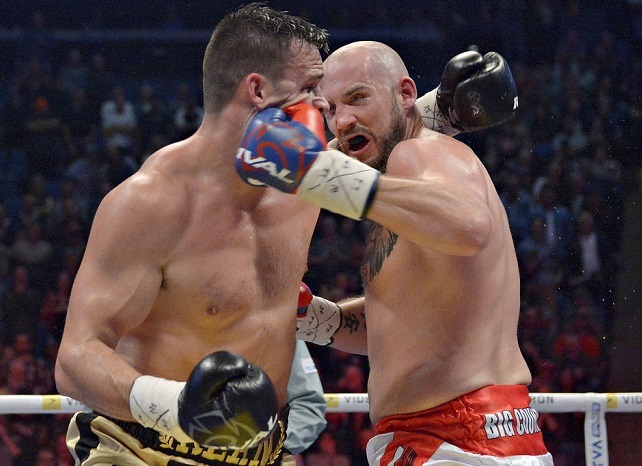 Carman’s last outing was a short but violent battle for the Canadian heavyweight title against Mladen Miljas that saw a rare double knockdown in the opening round, courtesy of simultaneous left hooks. In that case, it was Miljas who rebounded and ended the match in the second round. As a result, Kean was a heavy favorite to use Carman as a stepping stone to bigger opportunities, but it didn’t work out that way. 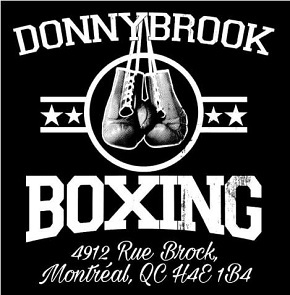 The fighters traded knockdowns: Kean tasted the canvas in the first, and Carman hit the deck in the second. But in round four Dillon landed a thudding right hand to the head and Kean went down hard. He could not beat the count. Carman improves to 14-3 and is now the proud owner of the NABA heavyweight title. 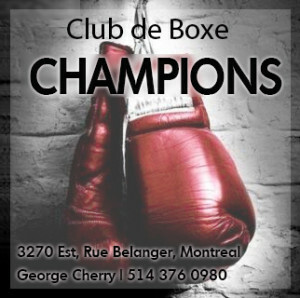 Other notable results from Quebec City: Steven Butler (25-1-1) stopped fellow Montrealer Jordan Balmir (10-1) in three action-packed rounds, and rising star Batyr Jukembayev is now 14-0 with 12 knockouts after he rose from a first round knockdown to stop Mexico’s Patricio Moreno (20-3) in seven. 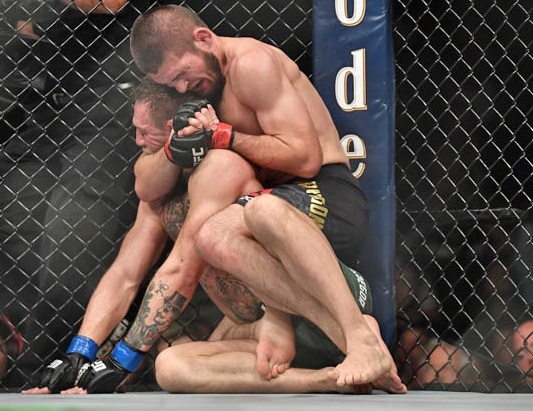 Khabib Nurmagomedov vs Conor McGregor: For some time now the most anticipated match for the UFC has been “The Eagle” vs “Notorious,” Nurmagomedov vs McGregor, and last night it finally went down in Las Vegas at UFC 229. For fans of MMA, the entire card was excellent and the main event lived up to the hype with plenty of high-octane action. The first two rounds were largely controlled by the Russian who seemed just too strong and aggressive for “Mystic Mac.” The second round especially was almost completely controlled by Nurmagomedov as McGregor was forced to absorb dozens of unanswered punches and elbows. Khabib applies the finishing neck crank. However, McGregor rebounded in the third as he stood his ground more and landed some uppercuts and right hands. But in round four Khabib forced another takedown and eventually took charge with a neck crank that forced Conor to tap out. The triumphant victor then unleashed all the venom he had held back in the face of the pre-fight insults and trash talk as he attempted more than once to get his hands on Conor after the fight had ended, before climbing out of the cage to attack McGregor’s team. Pandemonium ensued and no doubt repercussions from the UFC and the Nevada State Athletic Commission are on their way. Khabib being restrained in the melee after the fight. Naoya Inoue vs Juan Carlos Payano: With the World Boxing Super Series getting its bantamweight tournament underway, Inoue vs Payano was supposed to be a highly competitive opening match. On paper at least, the durable Payano (20-2) figured to give Inoue some stiff competition, but that’s not what happened. Instead a crushing and perfectly timed right hand detonated on Payano’s jaw in the first round and the fight was over after just 70 seconds of action, a shocking outcome. Inoue made short work of Payano.